Panda Antivirus-arvostelut 2019 – Miksi 4.4 tähtiä? Did a makeover and a change of name to its packages boost Panda Security’s protections for users? To find out, I had to dive deep into the company’s products, and I was blown away by what I found! Panda constantly receives some of the best marks from major antivirus testing labs, and all three of its major offerings give you a wide variety of features and tools that keep your computer running smoothly and safely. Panda Security is one of the most well-known antivirus makers in the world and has a great reputation. The company’s products give you several outstanding features that help you keep your PC and devices safe, protect your privacy, and even optimize your devices’ performance. Panda is also available for the most popular operating systems, making it an excellent choice when you’re looking to protect more than one device in your home. If you are looking for strong security and some excellent features to go with it, Panda is a top choice for you. When it comes to tough security and protection, Panda ranks near the top of the industry according to most major testing labs. The company has consistently scored near the top in tests by labs. Panda’s antivirus tools detected every single malware attack—even the ones it didn’t know before—when tested. If I had one small area where Panda could improve their tools is in how many false positives it reported (files the antivirus believes are infected—but are not actually), with a much higher number than other competitors. Even so, I always prefer to be more protected than less, and a few false positives are annoying, but not enough to dock the company points. Recently, the company updated its product lines to its new Dome suites, which offer enhanced protection and provide more tools for you to protect yourself from the many dangers of the web. Panda Dome’s security starts with an antivirus scanner that offers thorough protection and quick results when it finds a potential threat. The company’s scans check for the standard problems—viruses, trojans, and worms—in addition to malware and ransomware, which is quickly becoming a major problem if you’re on the web. Additionally, Dome scans any USB device you plug into your computer such as a Flash drive or an external hard drive. Even if you know where they come from, these devices are plugged into many computers, some of which may not be protected. If you’re not careful, even trusted sources can bring a virus into your PC. The best part is that Panda Dome doesn’t wait until you tell it to start a scan. The program is constantly scanning threats and will react instantly if it finds something on your PC. Another great part of Panda’s new Dome tools is that you can choose which scans you want to run. When you choose to start a new scan, you can select from Full Scan, Custom Scan, or Critical Scan. The first will check all of your computer’s files and directories, and the second will only check the folders you tell it to. I was most curious about the Critical Scan which only goes through the places on your PC that are normally where malware and viruses hide (such as your temporary files and cookies). I thought this was really useful as it helped me cut down my scan times and let me focus exactly on places I thought were more at risk. Instead of targeting individual computers, many hackers choose to attack your network. This gives them access to all your devices and can be even more dangerous than a regular attack. Panda Dome includes a Wi-Fi protection tool that locks down your network from any prying eyes or potential attacks. When you activate the Wi-Fi protection tool, you can monitor every connection to your home network, and you can easily approve or block them from accessing it with a single click. The Wi-Fi protection also lets you know when you connect to a public network that has lower protection standards than your own. This lets you check others’ activity and make smarter decisions about connecting to the network or finding your internet access somewhere else. Some other antivirus products I’ve tested recently have disappointed me by skipping over the firewall feature, so I was glad to see Panda includes a powerful personal firewall. When you install an antivirus, a firewall can help it do a better job by also limiting who and what can get into your computer from the internet. Panda’s personal firewall is completely customizable, so you can choose exactly how much you want to let in, and how much you want to keep out. More importantly, the firewall is always working in the background, so it keeps you safe even when you don’t realize attackers are trying to penetrate your defenses. Even with powerful protection for your identity, the most secure way to browse the web is still with a VPN, which can mask your real location and encrypt your data so that no one can spy on you. I was impressed to see that Panda includes its free VPN (which gives you 150 megabytes per day of bandwidth) in all three of its main Dome packages. 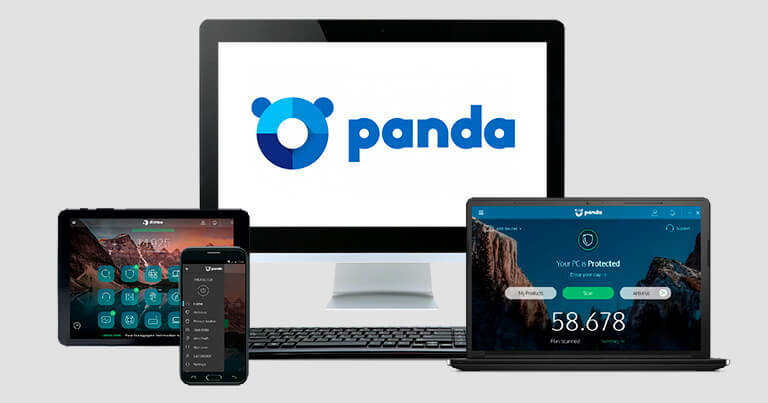 While it may not feature some tools full VPN suites offer, Panda’s free VPN is a great way to add more security to your PC and your privacy when you browse the web. For many families, one of the biggest concerns about the internet is how easily children can access websites and locations online that are not necessarily safe for them. This includes websites with adult content, graphic violence, as well as places where they may be contacted by individuals you’d prefer they avoid. Panda Dome’s parental controls give you the ability to decide which websites your children can and can’t visit thanks to an easy-to-use whitelist, and you can even use a filter to prevent any search results from leading them astray. To make sure your kids aren’t going anywhere they’re not supposed to, you can also monitor the filters and web activity from your children’s devices on the parental control screen. In addition to keeping malware off your computer, one of an antivirus’ biggest jobs is to protect your privacy when you’re browsing the web. Panda Dome has a full suite of tools that defend your privacy, which include the company’s Wi-Fi protection and VPN, in addition to several notable features. One of my favorites is the virtual keyboard which you can use when logging in to websites and entering your password. This may seem minor, but keylogging—where a hacker can monitor the keys you press on your keyboard to steal your password and data—is becoming a more common attack, and it can be catastrophic if you’re not careful. Additionally, the company’s Data Shield protects your files from ransomware by letting you choose which files to protect and giving you the ability to set permissions for who and what can access them. You can even choose file extensions to protect, which cover significantly more area than simply choosing files. This way, you could, for example, protect all your Word and Powerpoint documents simply by selecting the .docx or .ppt file extensions. Smartphones and mobile devices have more of our personal information than ever before, so I’m pleased when an antivirus company helps keep mine safe from robbers and hackers. One of the best features is the ability to track your devices in real time, which lets you know if one of them has been stolen. If they are lost or stolen, you can easily protect your data by locking your phone and remotely deleting any data you want. Even better, the anti-theft technology Panda provides even takes a photo of the culprit when they fail to unlock your device three times. This helps you locate your device and aids police in solving the crime. More than simply having it installed on your computer, an antivirus works best when you can easily manage all its features. Panda Security’s Dome packages all feature a quick and easy installation that you can complete with a single click when you finish downloading the products you’ve chosen. I was happy to see also that the amount of information Panda requires for users who buy their products are very minimal. I was also happy to see that the company’s re-branding also extends to its already-simple user interface. Instead of the plain and simplistic interface that its older line used to have. Now, when you open Panda Dome, the main screen shows you every feature and tool you have and tells you if they’re active currently or not. You can find more settings and specific features by clicking on each icon. Overall, I found that the new design makes finding everything you need significantly easier. If you find yourself with a problem you can’t solve, or even with questions about your antivirus’ features, Panda gives you several ways to find the answers you need. If your questions can be easily answered without a support agent, you can take advantage of Panda’s extensive resources on their website. They include handy guides, tutorials, and general articles about many of the most common issues users have. If you need a more personal touch with your support, you can reach the company via email, live chat, telephone, and even on social media. I found that Panda is very good at responding quickly, and all my wait times through every channel were minimal. I also noticed the support team was highly qualified and was able to answer all my questions easily. If you don’t want to wait for a support agent, you can also visit Panda Security’s forum, where you can get answers and share notes with other users and members of the company’s tech support team, as well. Panda Security comes in three major packages, with each giving you a slightly different set of features. If you’re looking for only the basic antivirus services and don’t need any additional features, you can choose the company’s Essential package, which includes the antivirus and firewall alongside some privacy protection tools. If you’re more concerned with privacy, the Advanced package includes parental controls, app locks, and a useful call blocker. Finally, Dome Complete adds the remaining privacy features (data protection and password manager), alongside many of the other mobile tools available. Overall, the upper tier products (Advanced and Complete) give you more value if you’re interested in bonus features and specific privacy protections. However, if you’re just looking for a thorough way to protect your computer, the Essential security plan is still a great solution. Käyttäjäarvioita ei löytynyt. Ole ensimmäinen joka arvostelee Panda!